Today Hrithik Roshan, Shahid Kapoor and Ranveer Singh may be ruling the roost as the dancing sensations of Bollywood but the younger generation may be stunned to know that the actor who started the trend of ‘dancing heroes’ in Bollywood is none other but veteran actor Jeetendra also well know as the father of Ekta Kapoor and Tusshar Kapoor. Though Shammi Kapoor invented rock and roll in Bollywood but it was Jeetendra who really gave a new dimension to dancing In Bollywood. With filmmaker Ravikant Nagaich’s bond thriller FARZ, Jeetendra set the ball rolling and became the First Bollywood hero who left his heroines behind in the dance movements. If readers can recollect the super hit song Mast Baharon Ka Main Aashiq…. (FARZ) they would agree that Jeetendra’s fast-paced dance movement in the song is truly breathtaking. In fact Aruna Irani, the famous actress and a renowned dancer, who acts opposite Jeetendra in the song Mast Baharon Ka Main Aashiq… in an interview once confided, “Before FARZ Jeetnedra had never done any commercial movie, forget dancing. Hence when film director Ravikant Nagaich told us about the fast packed western dance movement in the song Mast Baharon Ka Main Aashiq, I was confident but I thought how would Jeetuji (Jeetendra) do this dance.” “However on the day of shooting I was left stunned at the energy and the confidence of Jeetuji’s dancing potential, ” she informed. After the success of this movie and particularly the mega success of this song, the media coined the term Jumping Jack for Jeetendra. Jeetendra was India’s dancing star with an impeccable dressing sense that made him the darling of the masses. 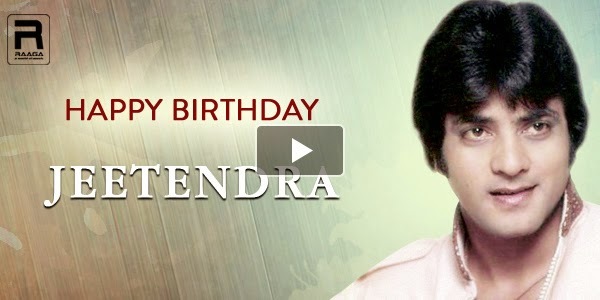 Raaga.com wishes Jeetendra many happy returns of the day.